Company Profile-Foshan Shunde Longde Textile Co.,Ltd. Longde Textile Co., Ltd, established in 1993, is located at Longzhou West Road, Longjiang Town, Shunde District, Foshan City, Guangdong Province, China. As one of the largest Hong Kong-invested and export-oriented manufacturers in China, we are mainly engaged in string knit working gloves and yarns. We manufacture various sizes of 7 gauge and 10 gauge string knit working gloves, T/C yarns, 100% cotton yarns, 100% polyester yarns and elastic yarns. 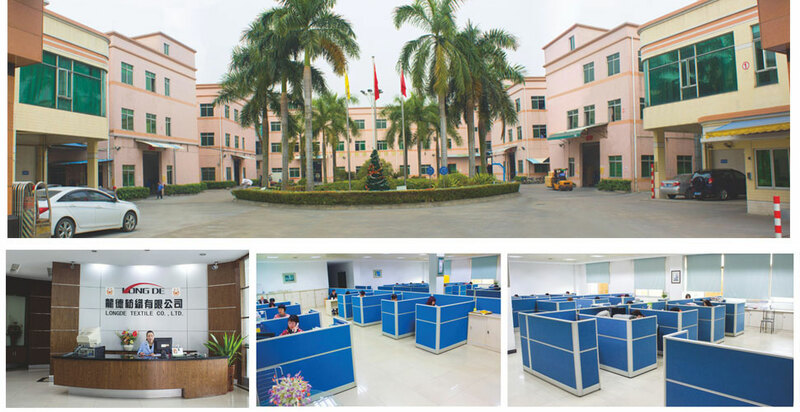 We occupy more than 80,000㎡ factory area and 120,000㎡ building area, and a total investment of over RMB 200,000,000. We own more than 2,000 sets of fully-automatic seamless SHIMA SEIKI glove knitting machines which were imported from Japan and full set of production equipment for polyester short fiber and cotton yarn spinning. The approximate annual output of working gloves is 20,000,000 dozen. As for polyester fiber and cotton yarns, the annual output reaches 6,000 tons and 15,000 tons respectively. Our products are well-known for good quality, and being sold at very competitive prices. Currently, we are selling our products to different parts in the world, including Japan, USA, Canada, Middle East, Southeast Asia, Russia, Europe, South America, U.K., South Africa, India, etc. Apart from that, we have also set up good sales network in Northeast, Northwest, Southwest & Mid-South China. We are located in the middle part of Pearl River Delta - Shunde District Foshan City, nearing by No.325 national highway, which is a famous international center of household electric appliances, furniture and flower. Transportation is convenient, as it takes only one hour from Guangzhou New Baiyun International Airport by car and 90 minutes from Hong Kong Harbor to Shunde Port by ferry. You are always welcome to visit us! Based on our principle of "Good Quality, Reasonable Price, Punctual Delivery & High Customer Satisfaction", we look forward to exploring and developing different business cooperation together with you both locally and globally.